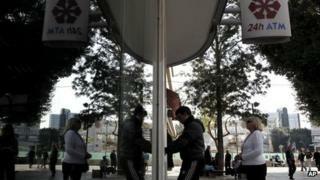 Cypriot officials have said the country's banks, which were closed to prevent mass withdrawals, will remain shut until at least Tuesday. On Wednesday afternoon the cabinet began an emergency meeting to discuss alternatives to an EU-IMF bailout deal rejected by parliament on Tuesday. Reports say the government is considering imposing capital controls when banks are reopened. Meanwhile, Cyprus' finance minister is in Moscow to seek help from Russia. Russia holds multi-billion dollar investments in Cyprus. Finance Minister Michalis Sarris said after talks with Russian Finance Minister Anton Siluanov: "There were no offers, nothing concrete," but he added, "we're happy with a good beginning." Talks are expected to continue in Moscow on Thursday. The banks will remain shut on Thursday and Friday this week and Monday 25 March is a scheduled bank holiday. The stock exchange also remains closed. Germany has said banks in Cyprus may never reopen if a bailout is not agreed. Earlier, Cypriot President Nicos Anastasiades met party leaders and the central bank governor in Nicosia to hammer out a Plan B, after a one-off tax on savings failed to get the support of any MPs. Mr Anastasiades has also been talking to the European Union, European Central Bank and International Monetary Fund (IMF). Bank mergers, a bond issue and more Russian funding have all been mentioned as ways to help the country out of the crisis. The establishment of a "bad bank" which would take on risky assets held by Cypriot banks has also been mentioned by officials. The BBC's Mark Lowen, in Nicosia, says Cyprus' banks are still giving out cash through machines - although with limits, and some are running low. Some businesses are now refusing credit card payments, our correspondent reports. On Wednesday, German Chancellor Angela Merkel said she regretted but respected the Cypriot vote. She said the eurozone had a duty to find a solution for Cyprus, but added that the country's current banking system was "not sustainable". Cyprus' banks were left exposed following the debt crisis in Greece and there are fears Cyprus could go bankrupt if they fail. German Finance Minister Wolfgang Schaeuble warned Cyprus that its banks might never be able to reopen if it rejected the bailout. Cyprus crisis: What happens next? The controversial levy had been proposed as the condition for the 10bn-euro (£8.7bn; $13bn) EU and IMF bailout. Cyprus was expected to raise 5.8bn euros through the one-off tax on bank savings. The plan was altered on Tuesday to exempt savers with less than 20,000 euros (£17,000), but a 6.75% charge on deposits of 20,000-100,000 euros and a 9.9% charge for those above 100,000 euros remained. However, parliament rejected the deal, with 36 MPs voting against it, 19 abstaining and none in favour. Protesters outside parliament reacted with joy at the decision. In Moscow, Mr Sarris met Mr Siluanov to discuss the easing of the terms on a 2.5bn euro loan Moscow gave Cyprus in 2011 - and the possibility of further funding - but no deal was reached on Wednesday. "We had a very honest discussion, we've underscored how difficult the situation is," Mr Sarris said. Cyprus has attracted money through its lower taxes, with Russians holding between a third and half of all Cypriot deposits. Russian private and corporate deposits are believed to total about $30bn. Russian President Vladimir Putin had called the bailout deal "unfair, unprofessional and dangerous". The 13 exploratory energy blocks south of Cyprus could hold gas reserves of as much as 60 trillion cubic feet, the head of Kretyk, the country's state hydrocarbons company said. That would be worth about 475bn euros at today's prices according to Bloomberg. Noble Energy granted first contract to explore Block 12 in October 2008. Unresolved conflict with Turkey over issue of national sovereignty surrounds the field, dubbed Aphrodite, with Ankara objecting to tenders issued by Cyprus. Analysts say Russia may provide more funding in return for interests in Cyprus' offshore energy fields. One offer of help has come from Cyprus' Orthodox Church, which is a major shareholder in the third-largest domestic lender, the Hellenic Bank. Archbishop Chrysostomos I said on Wednesday the Church was willing to mortgage its assets to invest in government bonds. Cyprus resident Gary Winwood told the BBC the situation was "dire" and there was great anxiety about the possibility of a collapse of the banks. "Most of our money is kept in deposits in a savings account so I cannot make withdrawals. The cash machines are supposed to be restocked but are often found empty. We've got enough money to last us until the end of the week," he said. Russian expat Natalia Kuleshina, who withdrew all her cash before the banks closed, said people were now afraid about whether salaries would be paid.